Obsession with a religious imperative leads a man to reason that if he kills the right people, their mourners will solve his problem. Is it too late to stop him? A shot in the synagogue parking lot brings Rabbi London running. He sees a gun and a pool of blood. At least one person is probably dead. The rabbi knows he should have seen trouble brewing weeks before when discussions about death turned nasty. But he was busy then with life cycle events and November and December challenges. Now, despite the rabbi’s teachings, the murderer has put his plan into motion. Soon there will be enough people mourning his victims to ensure the minimum of ten men at the daily service, and he will be able to say his Kaddish. Murder in The Minyan is a fast paced novel which allows us to vicariously experience the ups and downs of being a rabbi in a suburban Jewish community. Written by an insider who is the daughter of a rabbi, this story mirrors in a microcosm what rabbis experience as they tend to their congregations. The pettiness of some congregants, the generosity of others and the bickering which goies on about how effective the rabbi is rings true. Equally true are the moments of intense satisfaction when the rabbi makes a difference in the life of a family. The stress on the children of rabbis is also revealed. The murder conceit is a thin backdrop and midway through the book we know who-dun-it. 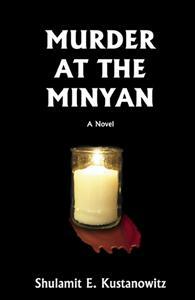 Murder in The Minyan might be required reading for all aspiring rabbis.